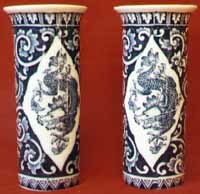 A blue & white design featuring Chinese dragons in a white diamond against a leafy scroll background, with two different geometric friezes top and bottom. Although similar to Prunus, this is a more complex design with a network of veins and stems behind the flower heads. 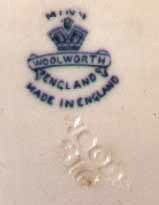 It is one of a number of Frederick Rhead designs manufactured for WOOLWORTHS and bears their mark rather than the WOODS one. 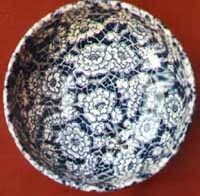 If only one could buy such items in today's store! 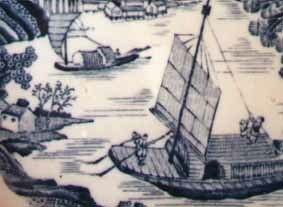 The items shown below were probably part of a dressing table set (see right). 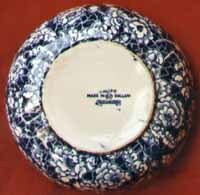 See Bumpus "Collecting Rhead Pottery", pp 28-29. 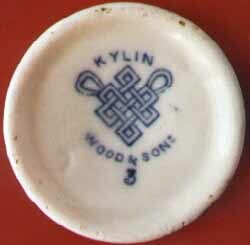 A Woods tableware design manufactured for WOOLWORTHS, and not easily found these days. 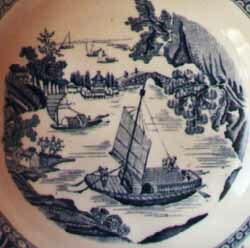 It features a Chinese landscape with figures on a boat, a bridge, etc, and is very reminiscent of Rhead's Kang-Hi pattern. See Bumpus, p 29. 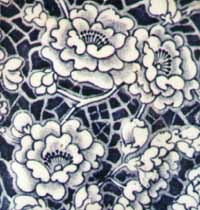 Other Frederick Rhead blue & white patterns: Kang-Hi, Chung.